by Ed Lopategui on March 25, 2015 . Last time on E(E), we lamented the alarming dearth of young talent with interest in Product Lifecycle Management (PLM), and its impact on future PLM innovation. The PLM Old Fart Paradox outlined how PLM is seemingly lost in its own museum. Long-fortified organizational and political barriers, limited avenues of open and frank communication not colored by established vendor agendas, and a distinct image problem are all troubling obstacles. Entry into the domain is both intimidating and precarious. These challenges are suppressing new ideas, the very fuel necessary to ensure future PLM value. But we’re here to do more than frown disapprovingly and toss a holy hand grenade into the fray and count to 5… er 3. It’s time to talk about how we get out of this mess, and it might take a few more posts. It’s time to choose… wisely. The first PLM Old Fart challenge involves how to effectively instill a global PLM perspective on young talent, despite the fact that such talent is often buried deep in the trenches of any given company practice. Understanding the PLM perspective is critical. Myopic practices drawn from the trenches are pervasive – it’s why everyone tends to use MacGyver style Excel (and duct tape) as the solution to everything. Pride in those types of solutions are often misplaced, but that doesn’t mean that knowledge gained in thick of battle is worthless. Quite the opposite, it’s invaluable. The challenge lies in balancing that trench perspective with a broader view across various lines of organization and ownership, both real and imagined. It’s about reaching across all the other trenches. While it might sound like some fancy hipster ideal to anyone in a company with hard organizational boundaries, how does one gain such a view? It’s hard to see the needs of others in the company (or the company as a whole) when output magically disappears across some opaque fence. 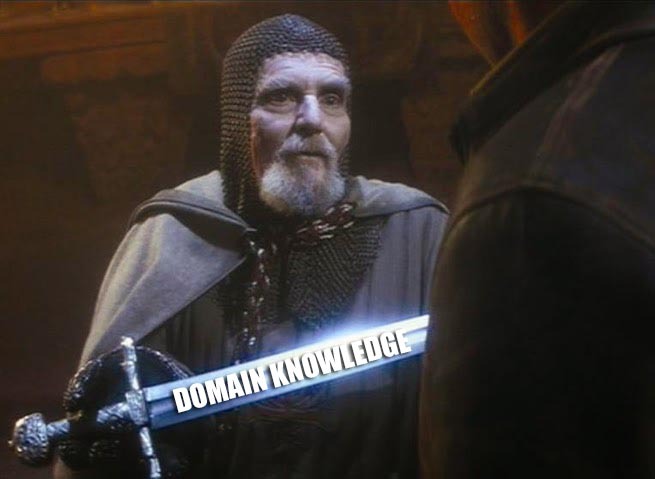 The solution up to now has sadly wait until you’re old, until you’ve witnessed myriad project successes and failures and then be mysteriously ordained into the order to defend the holy grail digital thread. We know how that one turns out. So the question becomes how do you create the perspective gained by a career in much less time? All without being incinerated, drowned, shot at, and chopped into fish bait? In the manufacturing industries that dominate PLM, promising young employees instead tend to be assigned a dark corner to toil away on widget A until they totally crush it, or fail outright. The reward for succeeding at widget A is work on a much larger widget B, but still from the exact same perspective. Some have built 50-year careers this way, essentially doing a variation of the same thing, albeit doing it very, very well. Incidentally, they tend to be the ones that most fervently defend whatever it is they have been doing for eternity before change is introduced. And we know that people and change are never on the best of terms. That time is done. Generational views, marketplace demands, and the more fragile, transformative impact of technology across any given business have erased the luxury of that stability forever. The future, it seems, shall be inherited by generalists, so the culture must evolve beyond always assigning specialists into fixed roles. Solution One is to rethink how we indoctrinate young talent into the fold to align with the generalist objective. It’s quite common in many industries that promising young employees are placed into a dedicated rotational program, designed specifically to instill broad business perspective in the participant by 3-6 month stints across teams, departments, and functions. The programs instill critical thinking and holistic, rather than functional, business views. Not surprisingly, they also do wonders for employee retention. Rotational assignments are a good start, but most are organized along the strict philosophy of ultimate placement within an organization. Taking the typical rotational program as a basis, imagine a program that plants the seeds for developing holistic solutions across organizations. Alternatively, perhaps attaching a cross functional project as the culmination of a conventional rotational program could do wonders – the equivalent of a collegiate final design project, if you will. The trick is covering all the time and expense to make something like this work effectively. But maybe such an approach is still not simple enough. Solution Two is to provide the opportunity for young employees to take responsibility for their own crap, end-to-end across its lifecycle. But what does that mean exactly? In a specialist oriented industry it’s very easy to be disconnected from the lifecycle of a product, because it moves across so many disciplines and departments. Typically, only a project manager observes a product from the entire lifecycle, and then only from a holistic perspective while relying on specialists for the details. There can be great benefit to having a specialist observe the product throughout its journey personally. Especially a younger observer who’s more likely to question what he or she witnesses. Think of it as assistant project manager of the month (but with a hands on focus). Understanding the problems, measuring the costs, and witnessing the failures firsthand does wonders for gaining perspective on reality. From a logistical standpoint, however, implementing something like this may be much harder than it might seem, because the selected individual will have to spend a significant time outside of their direct work responsibility. Longer lifecycles may make the learning process slow, and complex lifecycles may prove to be more than any one individual can digest. While most companies will view such an endeavor as strictly overhead, one could rationalize the added costs if they result in product or process improvements that yield concrete results. And the pursuit of new thinking to achieve those results is exactly what we’re after. May we go home now, please? There’s a better option, however. The primary shortcoming of the prior two solutions is a dangerous assumption – that the young talent that can inject new ideas and products into the PLM space already are employed anywhere adjacent to companies in the traditional PLM space. It’s also problematic that we’re trying to instill the wisdom and domain experience of a PLM expert through artificial means – we may not get reliable results. That’s why we have Solution Three, and it’s something we’ve talked about before. The most reliable way to join young talent with PLM domain experience is to create an independent environment where innovation can happen free of both organizational and cultural barriers: a PLM-focused incubator/accelerator. With corporations helping to identify problems and provide sponsorship, the old farts lending their expertise as advisors with some serving as future board members, and young, hungry entrepreneurs dreaming up off-the-wall ideas and hustling towards execution, it’s a win all around. And what will we find then? Perhaps illumination. We’ll explore further solutions for some of the other issues mentioned in the PLM Old Fart Paradox in a future post in this series. In the meantime, use your magic words in the comments below.